Termites. The word alone can send chills up the spines of Florida homeowners. 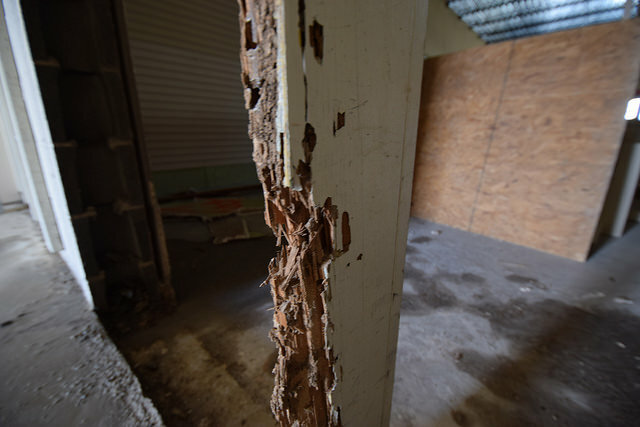 What’s scary is just how much homeowners don’t know about termites but are too scared to ask. Knowing the signs of a termite problem can help you prevent an infestation and save you thousands of dollars in repairs. A Free Termite Inspection from Superior Spray Service can save you thousands of dollars in damage. Call 863-682-0700 or click here to schedule a FREE inspection! Most termites in Florida are subterranean termites which includes the incredibly destructive Formosan species. Termites are dependent upon each other for survival and live in large colonies that revolve around the Queen and her King. Their colonies also include soldiers, workers and eventually reproductive alates. As their name states, subterranean termites live underground; sometimes up to several feet underground. These termites need to maintain contact with soil and moisture. Like their relatives, the Formosan termite who is also of the subterranean species, they create mud tubes to get themselves into your home. Subterranean termite species are found in every U.S. state except Alaska, though they are more common in humid, southern states like Florida. Formosan termites are a species of subterranean termites. These wood munchers are always hungry and eat 24/7. Formosan termites boast the largest colonies of any termite species in North America. Other subterranean species can have over a million termites in a colony, but Formosan colonies have up to 15 million! The workers in these colonies chew up wood, then regurgitate it to feed the others. They use their shelter, and mud tubes to maintain ideal temperatures and hide from predators. Their eating habits entail burrowing into pieces of wood and eating only the soft portions along the grain. This particularly invasive species is primarily found in the Southeastern U.S. and you guessed it, they are rampant in Florida. Swarming termites. Look for them near windows, doors, vents and lighting fixtures. Dropped or shed wings. Termites will shed their wings after finding a new home. All of the wings will be similar in size. Hollow wood. Termites eat wood from within. Tap suspected wood with a screwdriver handle and listen for a hollow sound. 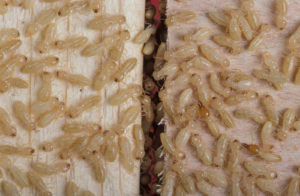 Termite droppings are wood colored and about the size of a grain of coarse sea salt. Wood, or other surfaces that appear warped or blistered due to termite activity below the surface. Eliminate moisture by fixing pipes, A/C units, and other leaky fixtures. Repair cracks in your home’s foundation with caulk. Make sure to check utility lines and pipes as well. Keep plants and mulch well maintained. Mulch should never touch your home. Store wood on a non-wooden platform and maintain a few feet of space between it and your home. Dispose of scrap wood from projects and yard debris such as tree limbs. Use correctly sized screens on exterior vents. Keep an eye on outdoor wooden structures (dead trees, mailbox posts, swing sets, bird feeders, etc) for signs of termites. Call 863-682-0700 or click now to schedule a FREE inspection!